YOUNGSTOWN, Ohio – General Motors CEO Mary Barra did not blame the United Auto Workers for the status of the now-idled Lordstown Complex, despite a claim by President Donald Trump on Twitter, a spokesman for the automaker said Monday. The president’s tweet Sunday night asserting that Barra held the union responsible for the plant was one of a series of tweets he made since Saturday regarding the facility, which turned out its last Chevrolet Cruze two weeks ago. Barra “did not blame the UAW for anything,” GM spokesman Dan Flores responded via email Monday night. The future of the Lordstown plant as well as three other U.S. plants being idled will be resolved between GM and the UAW through its national negotiations later this year. “To be clear, under the terms of the UAW-GM National Agreement, the ultimate future of the unallocated plants will be resolved between GM and the UAW,” Flores said in a separate email. “We remain open to talking with all affected stakeholders, but our main focus remains on our employees and offering them jobs in our plants where we have growth opportunities,” he continued. So far, GM has placed more than 1,000 employees from its unallocated plants to other GM sites, and opportunities are available “for virtually all impacted employees,” he said. Trump’s tweet targeting Green came after a discussion on Fox News suggesting that Trump’s re-election campaign could face trouble in the industrial Midwest. As part of the segment, the cable news channel, which Trump is known to watch frequently, showed clips from the president’s July 2017 rally in Youngstown during which he told those attending not to sell their houses because jobs were coming back to the area. 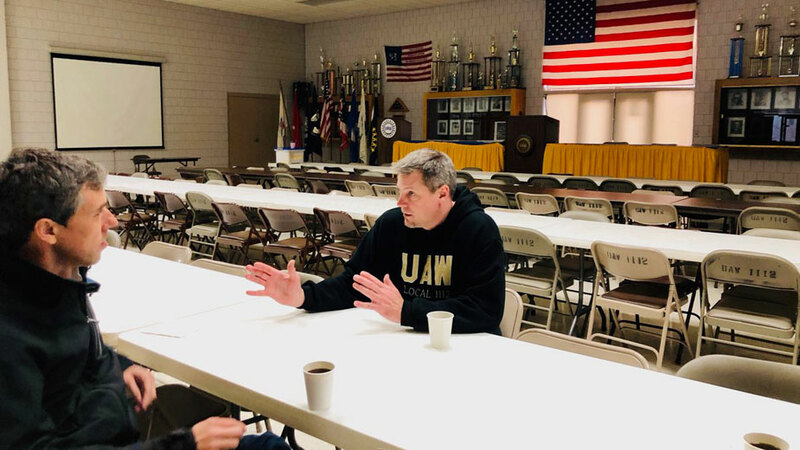 Against this political backdrop, Democratic presidential candidate Beto O’Rourke seized an opportunity Monday evening and made a surprise, unannounced stop at the Local 1112 union hall in Lordstown. O’Rourke, who campaigned earlier in Cleveland, posted a tweet last night along with a picture of his meeting with Green. O’Rourke also used Facebook to post a six-minute video with Green that was live-streamed. Green detailed the job losses, not just at GM but also at its suppliers and other workplaces his union represents. And he criticized the tax reform bill passed by Republicans that enabled companies like GM to reap a huge windfall without requiring reinvestment in the United States, and tax breaks that make it cheaper to produce vehicles in foreign countries and sell them in the United States. In his tweet Monday morning, Trump urged GM and the UAW not to wait until fall to negotiate a new agreement. “General Motors and the UAW are going to start ‘talks’ in September/October. Why wait, start them now! I want jobs to stay in the U.S.A. and want Lordstown (Ohio), in one of the best economies in our history, opened or sold to a company who will open it up fast!” he said. In response, U.S. Sen. Sherrod Brown continued his criticism of Trump and took aim at Barra as well. “Instead of fighting to save these jobs, President Trump decided to side with corporations and give companies like GM massive tax breaks to shut down American factories and ship jobs overseas,” he said. Trump’s comments about the UAW are “disgraceful” and Green “has done nothing but fight for workers in Lordstown, while the president has made lots of big promises and failed to stand up for workers at every turn,” he said. As Green said, Trump should support the senator’s American Cars, American Jobs Act to keep auto jobs in Ohio, Brown continued. And Barra “owes the workers from this highly productive plant an explanation” for the comments Trump said she made.